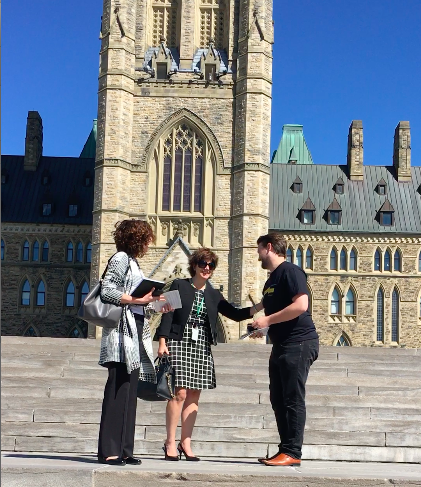 Prompted by World Tobacco Day, members of the international grassroots activist group Students For Liberty took to Parliament Hill on Tuesday to hand out their “No Nanny” plain-packaged chocolate bars to legislators and federal employees. Plain packaged chocolate bars handed out by Students For Liberty on World No Tobacco Day. Program Associate at Students For Liberty David Clement was present in front of Canada’s federal parliament on Tuesday to hand out the chocolate bars in protest of the idea of the plain packaging of tobacco products, due to be introduced by Prime Minister Justin Trudeau’s administration. Even more, Clement says there may even be evidence that smoking rates went up as a result of plain packaging in Australia. The World Health Organization, which sponsors World No Tobacco Day each year, says citizens should “get ready for plain packaging” in its news release on Tuesday. Such policies have already passed in Australia, France, the United Kingdom and Ireland, and many more countries will soon reduce the tobacco industry’s ability to market to its customers. That said, at least one international coalition of 46 groups upholding property rights across 30 countries, lead by the Property Rights Alliance, have sent a letter to Dr. Chan protesting the implementation of these types of laws which deprive the freedom of companies to market their products. “Plain packaging prohibits the use of trademarks and therefore significantly erodes the value of this intellectual property — a dangerous precedent to set for commerce in general,” the letter said. It’s these kinds of policies that Clement and others believe will lead to plain packaging of more than just tobacco products. “Plain packaging is spreading to other sectors like alcohol and food. This signals a new level of unjustified government intervention in consumer choice,” said Clement.